Screenshot of Yelp business page for Baker's Tree Service. 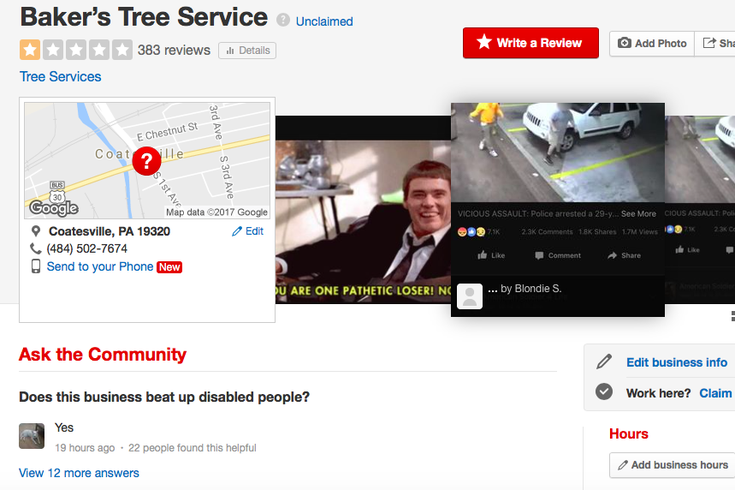 In addition to a slew of criminal charges in Chester County, the man who viciously sucker-punched an innocent victim with cerebral palsy is now facing a torrent of hatred at the Yelp page for his tree removal business. Barry Baker, 29, made headlines far and wide this week in connection to a surveillance video that showed him assaulting an unidentified victim outside of the 7-Eleven store at 200 S. High St. in West Chester. Baker was originally booked as a Coatesville resident, but Chester County prosecutors later updated their report in light of information that the defendant now resides in Delaware. In the surveillance video, Baker is seen imitating the 22-year-old victim before taunting him and callously punching him in the face. He then fled the scene. Baker's Tree Service has racked up 383 reviews that amount to an average of one out of five stars. The 71 photos uploaded to the Yelp site are primarily memes attacking the Baker, who was described as a "bully" by Chester County District Attorney Tom Hogan. Hogan said the case will not be prosecuted as a hate crime, as criminal statute in Pennsylvania does not currently classify physical or mental disabilities under that criteria. Most of the comments posted on the Yelp page are too vulgar to reproduce, but here's a sample of what reviewers had to say. "RIP Baker's Tree Service," said user DL H. "The price you pay for being a dumb--- and assaulting the disabled, the internet has now disabled your personal business, loser." "If you want to hire a coward that sucker punches people with CP.....then Barry Baker is your boy. What a coward!" added Michael M. of Philadelphia. "The owner of this company sucker punches physically disabled people for fun," wrote New Jersey resident Pete H. "Do not support him or his business. Sick sick man." Baker has a lengthy criminal history in Chester County, as detailed by The Daily Local. In 2007, he pleaded guilty in a case involving the theft and sale of 200 military flag holders that were lifted from the grave sites of veterans at a pair of cemeteries in West Brandywine and East Fallowfield. He also remains on probation for the receipt of stolen property from a motor vehicle in 2009. In the West Chester case, Baker is charged with simple assault and related crimes. He was released after posting 10 percent of $25,000 bail and will appear for a preliminary hearing on May 30.